The peptide view page provides a table view of the data at the peptide level. That is, all peptides (and crosslinked peptide pairs) identified by the search software may be viewed on this page–along with accompanying peptide spectrum matches (PSMs) and tandem mass spectra. The data presented may be filtered according to confidence, type of peptide, and which modifications are present on the peptide. 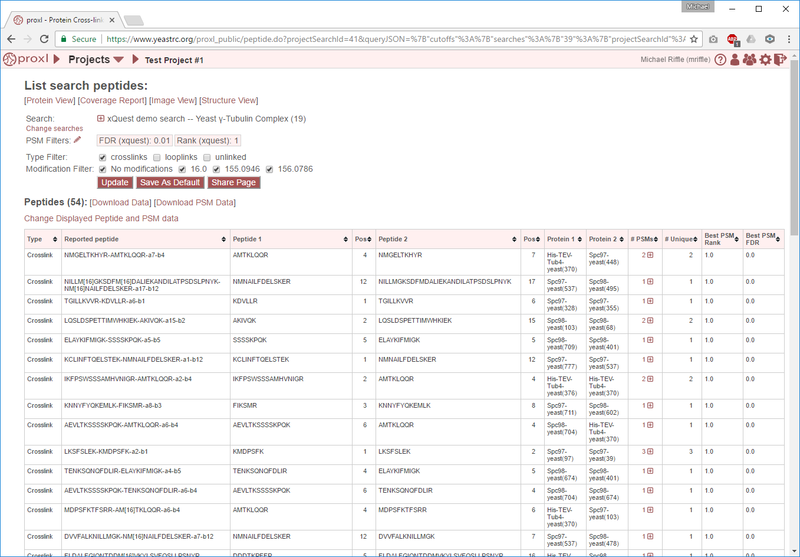 Note, this document covers the peptide view page for a single search. For the view page seen when merging multiple searches, see Merged Peptides View Page. The name of the search (and internal search ID reference number) from which these data were obtained is shown first. The red [+] icon may be clicked to reveal details about the search. The “Path” is the location on disk from which the data were imported. The “Linker” is the name of the crossinker used in the experiment. “Search Program(s)” is the name and version number of the PSM search software used. “Upload date” is the date the data were uploaded into proxl. “FASTA file” is the name of the FASTA file used to perform the PSM search. If the user changes any filter parameters–such as PSM/peptide score cutoffs–this button must be clicked to reflect the new filter choices. Project owners may click “Save as Default” to save the current URL as the default view of the “Peptide View” for this search. This default view will be populated with the same options as when the button is clicked. This is a convenient way to share data with collaborators or the public that does not require that they manipulate the image viewer to see the data. The data presented may be filtered according to the following criteria. Note: Only peptides that meet ALL of the specified criteria are returned. Important: It is necessary to update the data on the page after changing filter cutoff values. After clicking the “Save” button, you must click the “Update” button on the page to apply any new PSM- or peptide-level filters. crosslink - A pair of peptides linked by a crosslinker. looplink - A single peptide with two residues linked by a crosslinker. unlinked - The peptide without a crosslinker on any residue. Checking multiple boxes will include any peptide that has at least one of the checked types. I.e., checking ‘crosslinks’ and ‘looplinks’ will only include peptides that are either crosslinks or looplinks. Only checking ‘crosslinks’ will only return crosslinked peptides. Only peptides with at least one of the checked modifications will be included. Note that monolinks are considered modifications of residues in proxl, so the mass of the crosslinker when found on monolinks is included here. In order to apply new filter parameters to the shown data, the “Update” button must be clicked. This will fetch filtered data from the proxl server and display the data on the web page. Project owners may save the current filter parameters as the default view of the data on this page by clicking this button. This default view will be shown when users follow links to the “Peptide View” for this search. Above the table is the text, “Peptides (#)”, where # is the number of distinct reported peptides were found for this search. A distinct peptide is the combination of peptide sequence(s), linked positions in those peptides, and the location and type of post-translational modifications. The columns are described below. Note that all column headers may be clicked to toggle between ascending and descending sorting of that column. Holding the shift key while clicking column headers allow sorting on multiple columns. The type of peptide (crosslink, looplink, or unlinked). The peptide as it was reported by the search program used. The parsed sequence of the peptide (or the first peptide in the case of crosslinks). The position in that peptide containing the linker. The parse sequence of the second peptide in the crosslink. The protein(s) to which the first peptide matches, and the position in that protein to which the linker position in that peptide matched. Mouse-over the protein name to get a description. The protein(s) to which the second peptide matches, and the position in that protein to which the linker position in that peptide matched. Mouse-over the protein name to get a description. If peptide-level scores are available for this search, the scores will appear as separate columns. Columns will appear for each PSM-level score on which the results are currently being filtered. Each of these columns will show the best PSM-level score for each respective PSM-level filters. E.g., if p-value is being used as a PSM-level score, the best PSM p-value will be displayed for each peptide. All PSMs meeting the current filtering criteria that map to a given peptide can by shown by clicking on the table row containing that peptide. The predicted charge state of the precursor ion. The observed m/z of the precursor ion. The retention time in minutes. The filename of the scan file. Each PSM-level score will appear as a separate column. The annotated mass spectrum may be viewed for any PSM by clicking the “View Spectrum” link. For help on our spectrum viewer, see the Spectrum Viewer page. All column headers may be clicked to toggle between ascending and descending sorting of that column. Holding the shift key while clicking column headers allow sorting on multiple columns. Clicking the [Download Data] link will download the shown data as a tab-delimited text file.